Please visit our Calligraphy BUTTON on our home page BEFORE filling out any forms. Whether needing Digital Calligraphy for your Envelopes, Place Cards, Certificates, Favor Bags or Tags, we would love to help! For more information about invitations, other custom services, and digital calligraphy please see our home page. We will be in touch within 1-5 days to discuss your request. Traces of Heaven + GiftBandit has been serving our customers with Invitations, Design, and Digital Calligraphy Services as well as Do It Yourself Projects since 1978. Some of the products listed below relate to our Digital Calligraphy Services. Copy & Paste any item shown below into the Contact Form. • Envelopes Material: Flat Matte or Metallic Sheen? • Envelope Lined or Unlined? • Color of Ink Desired? • Note we will provide an XLS spreadsheet from which to work. 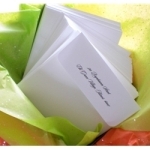 • Quantity of PLACE CARDS? • Place Card Material: Flat Matte or Metallic Sheen? • Are the Cards Blank? Or are they somewhat printed? • Design or Artwork Desired? • Do you need FOOD identification printed on front or back? • Quantity of CERTIFICATES being printed? • Will you provide Paper or wish us to provide it? • Certificate Material: Flat Matte or Metallic Sheen? • Is there printing on 1 or 2 sides? • Is the Certificate Blank? • Is it a Fill in the Blanks Certificate? It is helpful to know where you purchased your stock, especially Envelopes and Place Cards. This information gives us a general idea as to which printing method to use. Fonts and lettering styles are found all over the internet especially on Pinterest Fonts. Nearly every stationery or craft blogger has a collection. Because of this we can find them easily and quickly. Of course we would love to collect them all. If you find an unusual font, by all means send it to us. We will consider adding it to our font library, but do note: not all fonts are created equal, usable or worthy of installing, as some may be corrupt or not for commercial use.